What I have been doing on the weight loss front just isn't working well. It is just that the effort I'm putting in does not reflect in the results. While my weight hasn't gone up too much, I've yo-yoed in a small range, never really getting the breakthrough I think I need. I've found that I do well during the week but the weekends are my nemesis. My injuries haven't let me really push training so the amount of training that I've been doing feels like much less than usual. It probably isn't a tremendous amount less but it feels like a lot less. Doctor's orders say that my rides can only be at an easy (exact quote: "not crazy like a spin class") effort. No running (limited strolling instead) and I'm still building up my swim duration from my broken rib. It is better than stopping cold turkey but I can't count on bumping up the workouts to help burn more calories. So I need to mix it up a bit. Call it what you want: induction, detox, boot camp, intervention, refocus, pond scum (? ), whatever. I've decided to make February an intense focus on weight loss. Call it Anti-Fatty February. What does that mean? I'm not really leveraging WeWa properly so I'm stopping paying the monthly fee. My doctor once said most any of the major diet programs work IF YOU FOLLOW THEM. I haven't been following it (and it shows) so it is time to try something different. I'm going to use The Daily Plate to track all the food that goes in my tummy. This will help me identify where I succeed and where I fail. Sort of using this to identify red, amber, and green times and days. I'm going to track my weight daily to see if the weekend nemesis continues. I'll post on the blog the weekly weight on Fatty Friday (or hopefully anti-fatty Friday). I'm not a saint so I'm giving myself two days of amnesty already: 2/7 (there is a football game that day, a new microbrew for me [Blue Point Winter Ale] is already in the fridge and I bought a bottle of Johnnie Walker Blue to sip a bit while the game ) and 2/13 (dinner plans at Morton's for Valentines Day/MrsRockstar B-day). I'm not going to set a weight loss target. I doubt I will get where I need to be in one month (I'm about 25 pounds off) but this is just to get me on the right direction and path again. I've already apologized to my family as I expect it to be miserable to be around me for a few weeks. I hope that by March I'll be able to kick up the training a bit. My hip/knee seems to be improving but at a glacial pace. Walking seems to help and I should be able to swim long enough to resume Team Total Training Master's Swim classes soon. Guppies, here I come to join you. Watch out, fat guy doing cannonballs. Losing weight can't wait until my injury heals. This can be the new month resolution for February. I'll keep grinding away at the January resolutions but add this one to the pile. I registered to take the USAT Level 1 coaching class scheduled for this April in Baltimore, MD. I hope this 2.5 day lecture based class will provide me with a foundation of knowledge so that I can understand the training process better. This isn't an inexpensive class. In addition to the tuition and burning a weekend, I have to drive down to Baltimore (about a 4 hour drive) and stay in a local hotel. I have to get a background check done to make sure I am not an ax murderer or the like and after the class I have to complete the final exam and send it in. In a past life I was one of the cycling coaches for the local Team in Training chapter. Besides learning how to ride slow and for a long time, I learned how to get newbies to the point where they could successfully complete a Century. I still occasionally ride with the team but I haven't coached officially in a while. So, why take this class at all? Gunna to put your shingle out and become "Coach Rock Star Tri?" The short answer is most likely not. I don't expect that I can dedicate the time necessary to become the type of coach I would be proud to be but I do expect that I will learn something that will help me in my own athletic adventures. If I could help others from time to time, great, but that isn't the focus. A little bit of knowledge could make me dangerous and I hope this doesn't turn into a complete waste of education (sort of like my MBA). Last night I completed a 7 hour, 2 night course in First Aid, CPR and AED offered by the local American Red Cross office. I've taken CPR classes in the past but it has been a long while. I, along with what seems most (there was only one person in the class who didn't take some flavor of this class before), did not go through the re-certification process so had to retake the whole course. I've never done the AED flavor before and the last time I reviewed first aid I was a boy scout. As hard as it may be to believe, I was a crappy boy scout. Most of the people in the class were doing this to meet a requirement for work or some thing. I've never had this as a work requirement but took it this time (as well as in the past) to prepare for a "just in case" scenario. Of course it would be best for me (and it is all about me after all) if those around me took this class just in case I need help. The likelihood of me needing first aid could be considered low since I already got hit by a car while cycling but lightening (or something like it) could strike again. This course is painless except for finding the time to take it. It would be best if I never need to use the knowledge in this course but I'm trained just in case. For those who aren't aware, one of the ways to get guaranteed entry into the NYC marathon is to, as a New York Road Runner member in good standing, run and finish 9 qualifying races and volunteer for another. This is not for the current year but for the subsequent year. This means if you meet this requirement during 2010, you could be toeing the line of the marathon in 2011. I did this in 2008 for my entry in 2009 and I was doing this in 2009 to get my entry into 2010 until I got hit by a car. I had 7+1 done but since I couldn't race the marathon in 2009 I was able to defer my 2009 entry to cover the 2010 event. I can't run now due to my hip injury but I've decided to try to do the 9 this year anyway (maybe I'm insane but I'm still hoping for a quick recovery). I don't expect to be running the marathon in 2011 but plans could change so I want to have an option. I still expect to be doing something of the iron flavor in 2011 but having the 9+1 could give me a choice to do the marathon instead. After I earn entry into the marathon in 2011, I would have a choice to defer to 2012 if I want. This flexibility is good. Most of these races I use as "C" type of races which are more like supported training runs rather than races. They are timed, of course, and they do provide opportunities to set PRs and the like. They range in distance from 1 mile to beyond a marathon in distance. Some of these are really fun to run too. I signed up for the first of these races even though I can't run but mainly because it is a fun race. It is on Superbowl Sunday morning and my daughter Amanda wanted to run it. Before the race is a football throwing contest and I fully expect to toss the pig skin before I walk the 4 mile course. Many people (thousands?) will be walking it with me. This race limits out at 5000 participants and it should sell out. Walking it will still count as one of the nine as long as I finish since there isn't a time limit. No matter how good I may feel I will not run nor jog it. I'll probably be pouting over my weak showing in the football toss but we'll head home to celebrate the football game styling in our Gridiron classic race shirts (unless the Jets pull another rabbit out of their hat and in that case I'll be wearing green and white). My children are both excellent musicians. This weekend was the Nassau County Music Educators All-County Music Festival. In order to be selected to perform, there is a whole audition process involving the students preparing some psychotic piece to play (and be graded by an independent judge), nomination by their teacher and ultimately selection across all of the schools in the county. Both of my children were selected to the orchestra but in different age groups. After a week that they had multiple nights of 4 hour rehearsals, two 3 hour concerts (including orchestra, band, jazz band, and chorus) were on the agenda this weekend. Each concert included school administrators getting up to pontificate about how funding for the arts is in jeopardy due to the economy, blah, blah, blah, how music education is important, blah, blah, blah, what a pleasure it was to see the children learn and grow, blah, blah, blah. What does this have to do with running, racing, and triathlons besides showing that I'm a proud Daddy? One of the administrators, after his initial words that sounded like every other administrator, broke the speech template and actually said something interesting. He said that the musicians have put in the hard work and now it was time for them to show off. I plan on using this statement as my mantra for my next race (whenever it may be). That's much better than thinking a race as an exam. Do the work, then it will be time to show off. Got to hop on the trainer now while I watch the Jets tease the faithful again. Doing the work. I went back to the doctor today since the ITB pain in my knee was not getting better with physical therapy and, in fact, was getting worse. My hope was to get some real drugs and potentially a MRI to confirm the diagnosis for the outside of my knee. While I was there I figured that I would have them take a look at my hip and interior knee pain that started up a couple of weeks ago (prehalf marathon) but also seems to be getting worse. There was a screw up with the appointment and the doctor I initially saw wasn't in. I asked if I could see his partner (I don't have any sort of life commitment to a doctor I've seen only once). They hooked me up. They took xrays of my hip and then he moved my leg into many positions that it wasn't meant to be in. After looking at the xray he said "your running career is closer to the end than the beginning." He didn't seem to care too much about my knee (ITB is ITB) but it was all about the hip. The xray shows I've got arthritis, bone spurs and hip impingement (femoroacetabular impingement). He gave me drugs, an exercise routine, and said stop running. Completely. Gentle bike riding should be OK (he said don't do anything crazy like a spin class or something that is hard). Anything in the pool should be OK. If the drugs work, I can try walking on a flat surface (no hills at all). If not cured, come back in 6 weeks and we'll talk next steps (most likely MRI with contrast and/or pain injections). He said don't plan on running multiple marathons or the like pretty much forever. As you can imagine, this didn't make me happy. I moped around for a while but then started thinking (which is always dangerous). I decided to give this no running thing a chance to cure me. I'm going to bump up my weekly swimming sessions and will ride only gently for a few weeks. If that doesn't work, stopping exercise and gaining back the weight aren't options. I've got to figure out what I can do and then do it. The journey just got a little harder. Time to earn the rock star status. Somebody has to do it so it might as well be me. Almost any recap of last weekend's Disney races has to have the weather as the leading character. Going in I knew that it was supposed to be cold and I thought I packed OK race wear but realized (too late) that I always somehow disregard the impact of rain. Mother Nature released both rain and cold at us in the land formerly known as the sunshine state. I expected the leading character of this weekend to be my knee pain coupled with my lack of recent training. My last real run was before Thanksgiving meaning that I really haven't had a significant run in over 6 weeks. I thought that my fitness wasn't totally shot but my knee was getting worse. To add insult to injury (pun intended) my hip was starting to hurt too and I thought that was due to the PT making me stretch where no stretch has gone before. I did find some old magic anti-inflamatories in the back of the medicine cabinet and started taking them a few days beforehand. I also bought a, hopefully magic, ITB strap to help lessen the ITB tension. I would have bought a voodoo doll if it was available as well so, why did I attempt this race at all? One word sums it up: stupidhead. I originally signed up for the full Disney Marathon via Team in Training. I've done a bunch of events with them. I wanted to do a marathon to prove to myself that I could and my 2009 NYC26.2 dreams had to get deferred once I got hit by a car while riding. To make Disney extra special I figured I could do another event with the Team even though I was training more on my own. They actually wound up hooking me up as they, as the primary charity for this race, were able to switch me from the full to the half. Otherwise I would have been locked into the full and that would have impossible even for a crazy person in my physical state. There was little difference on my doing this race on my own vs. doing it with the team as I didn't partake in any of the TNT festivities and even stayed at my Florida house instead of with the team. (Note we rent this house out for vacations and such so check out the website here if you are interested). We arrived in central Florida on Friday afternoon and the rain started shortly after our arrival. The weather report called for temps in the thirties and rain throughout the half. Then it was going to dry up and get cold for the full. Oh goody. After getting hooked up with the right race number at the expo we decided to get an early dinner at a local Olive Garden. What a novel idea as there was a line out the door with marathoners at 5PM. I normally freak out the night before real events so I decided to have a glass of wine to mellow me out and it worked (!) so this has been added to all future prerace rituals. We went to bed early with the clocks set for 2:45 (race directors suggested being onsite before 4AM due to road closures, etc). I've was trying to figure out what my race strategy should be and figured that I would start and see how it was going. I would "jog" the first 10 minutes, walk a minute of every ten and continue that as long as there was no significant pain beyond the usual. If there was discomfort, I would walk. If there was pain, I would stop. My hope was to run at least a 5k of the half and not get picked up by the sweep vehicle (Disney has a bus that follows the race at 16 minute/mile pace and if it catches you your race is over). I wanted to finish it to get the medal and to "earn" the shirt. My wife wasn't trying to talk me out of my plan (which was weird). I guess she knew I knew I was a stupidhead and there was nothing that she was going to say to convince me otherwise. When I woke up I had a text from my coach of "you're not going to do anything crazy, riiiiiiigggggggttttt" but doubt was creeping into my head. We left for the race start and the weather was horrible. The car thermometer said 33 degrees and it was raining. The wind was blowing. We were able to park at Epcot right near the start and decided to stay in the car with the heat on until 4:45AM. That was one of the wisest moves we made all day. We spent a few minutes in the TNT tent to get out of the rain and now the snow and sleet started. It felt like jellyfish stings on my face. The fashion statement of the day was wearing a black leaf bag as a coat and I was one of the few that could make it look good. The race announcements said that it would take 20 minutes to walk to the race start and I got there just in time for the corral to start moving. They had me in corral "C" which should have been for sub 2:20 runners but somehow I was able to convince them at registration that this was my place too. This was part of my "don't get on the bus" strategy. The race started in the dark and the crowd started moving. Then everyone started stripping off layers and the wind was blowing the garbage bags around. They were incredibly slippery and I'm surprised that I didn't see anyone go down. I ran my 10 minutes and then stripped off the garbage bag. Some of the race course was narrow and with almost 20,000 runners it got tight. I ran another 9 and then stripped off a fleece that I expected to throw away anyway (note that Disney said they were collecting the clothes discarded and would donate them to some charity). I then got into somewhat of a rhythm but I kept going too fast. I wanted to run about 12:00/mile to make sure I was jogging but the Garmin kept showing me as sub11:00 during the run portions (once I even saw sub 10:00). Normally I would be looking for a quicker pace but I didn't want to blow myself up with a quick pace. But overall I felt OK. I started getting tired after about an hour and I was then coming up to the Magic Kingdom. The excitement of the crowds got me to run through the park and just past the 10K mark my body started aching so I decided to walk a bit. I was happy. I exceeded my expectations. I was in no danger of being picked up by the bus but now I had to get back to Epcot. The sun was just coming up. After walking about 5 minutes I decided to give a walk one, jog four minute deal a try. I would break it up at every water or nutrition stop (note that frozen gels have the consistency of a tootsie roll) and was feeling better. Then stupidhead hit again. I did this race 2 years ago and did a 2:53 with a lot of walking. If I could beat that time it would be great. I started picking up the pace. Then I figured if I really pushed it I might break 2:40. I didn't, finishing just under 2:43, but my last 5k was my fastest split. Go figure. I finished strong. Then reality hit. I went right to the medical tent to get ice for my knee. I found my wife and gave her a kiss. I wasn't feeling excess pain but my muscles did know that they did something. Overall I was in better shape than I hoped for beforehand. Sunday I cheered on some friends doing the full. It was even colder (mid 20s) and the wind kept up. They had a hard day but got it done. Good job guys. It gave me an appreciation for how this is and my wife does it a lot. My wife is very smart. She knew I was a stupidhead and she knew I knew she knew. Even so, she did everything she could to help me get over my insanity. My fitness over the past few years has improved dramatically. I almost set a PR for a half marathon without adequate training. Imagine what I could do when healthy and properly trained? My Garmin got screwed up and I couldn't download the data. I spent 2 hours on the phone with tech support before we gave up and had to reset it, losing the data forever. I got my spilts from the official race result website. It is past time to get my physically fixed. Enough is enough. Next big race is early April. The short story was the temperature was mid 30s while I waited in the parking lot with 10-15mph winds, rain, sleet and snow in the air and the weather didn't really improve from there. 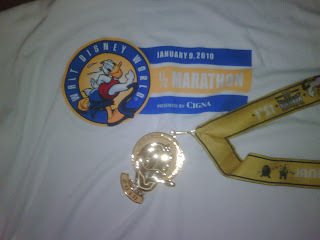 Even so, I finished the Disney Half Marathon in 2:42:54. Even better is that I can still walk afterwards. Long story to follow when I return to NY to warm up a bit. Do you view a race as a final exam or a reward for putting in the training? This weekend I'm going to Florida to possibly attempt some of the Disney Half Marathon. Confidence is low that I'll even get to the starting line let alone the finish line. My knee is, if anything, getting worse. I had to stop a bike workout the other day due to the pain and now it hurts almost all the time (as compared to before when it only hurt while running). The PT is wondering if anything else in additon to ITBS is going on. I have a follow up appointment with the ortho next week. None of this stopped me from squeezing in an outdoor run (albeit a slow 2 miles) yesterday to celebrate the 37 degree heatwave in RockStarLand. Luckily Florida is always warm. Race start temperature is predicted to be...........29 degrees with rain? What kind of joke is that! (Hey Floridian weathermen: when it is 29 degrees precipitation is normally whiter than rain). My main goal at Disney is to have fun and not injure myself. I had the same mindset when I ran the Dorchester Half Marathon last April after I tore my calf muscle diving out of the way of a nanny pushing a stroller with an infant in it through the end of a 15k race in Central Park. It took me a long time to recover from that injury but the Dorchester race ended with me happy even though I bailed after a painless 5 miles (my original hope was a painless 3 miles). I also had this mindset when I did the Montauk Century in 2007. I was recovering from shoulder surgery and managed only two training rides coupled with a few spin classes beforehand. My plan was to do most of the ride before my body started complaining (somehow I thought I could easily do about 80 miles) and then limp it in. My body didn't really listen on that day (ok, when does it listen?) and I had a long way to limp in. I finished that century, it was much harder than it should have been, but I was glad I did it. I read somewhere that some athletes view a race as a final exam while others view a race as a reward for training. I've never viewed a race as a reward and almost aways view a race as a exam (an "A" priority race is a final exam). That may mean something is wrong with me but I wish I could go into any race with the mindset of a race being a reward. So where does that leave me with the Disney Half? Reward or exam? I don't have anything really to prove with finishing or not finishing this race and have bumped it down to a "C" priority. I have other half marathons already on the calendar for later this year that are more important to me. I'm not really viewing this race as a exam since, at best even if I finish, I hope to get an incomplete with more walking than running. I don't view it as a reward either since I really haven't put in the running training I would have needed to in order to make this a reward. I think the best compromise for this race is to go for the reward of an incomplete. This probably wasn't what they were looking for as an answer to the final exam or reward question but I'll make it work for me. What is the reward for training? I don't know but I bet it is a question on some final exam. The naughty and nice list isn't just for Christmas. Which are you on this week? Thin socks weigh less than thick socks. Shoes don't matter since you take them off before you step on the scale. Wear pants that don't need a belt. If you find "Sansabelt" pants in the closet, throw them out. Never wear a sweater while weighing in. The added weight of underwear is not worth not going commando. Drink as little water as possible when you take your morning vitamins. There is a limit to how many times you can go to the bathroom before a weigh in. Find that limit. Every time. Haircuts are optional (but can't hurt). Shaving is not optional. Hair gel is not encouraged. Cutting your toe nails beforehand won't change anything but cutting your fingernails might. Doing a workout before a weigh in can be viewed as cheating (unless you do it before every weigh in) since the weight lost from sweat loss will vary on the workout intensity. The meal after the weigh in should not be a considered a celebration requiring copious amounts of celebratory sweets. The number on the scale is more like a compass than a destination. Both are required for the journey. This isn't your last weigh in. Today is body composition Thursday and I weighed in at home. My scale is evil. It said there is more work to do. There were a few goals that I considered setting but elected not to. The first of these "ungoals" was setting some amount of annual mileage. I took a look at TrainingPeaks and it said in 2009 that I biked 2192 miles (a mix of trainer and on the road), ran 455 miles, and swam for just under 50 hours. It is hard to gage these numbers since I missed a bunch of time due to various injuries, some more impactful than others (an unstated goal is to not get hit by a car again). My inkling is that all the distances will go up and the ratio will change slightly in favor of little more in the run and swim categories even though bike will still win (by a lot). I'll track the mileage this year but the grand total at year end should be "enough." What numbers are "enough?" Thinking about this will only get me into trouble so I'll leave that to CoachBikeMike. The second of these ungoals relates to swimming. Swimming is more frequency based rather than distance based. I'd love to have 3 swims a week but I figure that will shake itself out as time goes by so it doesn't warrant obsessing on it. I'm not a good swimmer. I'm probably an OK swimmer but if invest a ton of time at it I'll be.......still not a good swimmer. I may cut a few seconds off my swim time but in the scale of things, this isn't a big deal. If I can get through the swim without any additional exertion than now, that would be great but real triathlon race improvement should come from the bike and run. The last ungoal has to do with my blog. During last year I posted 125 blog entries. That is a little frightening to me since I really didn't have any expectations of what I would do and what I would get out of blogging. For years in school I was told that writing was one of my weaknesses. Then magically people began to say I wrote well. I still think I often write unintelligently and am amazed when something I write actually makes sense (somewhat like monkeys coming up with Hamlet - OK maybe not that bad but at least like monkeys coming up with the script for an infomercial). That hasn't stopped me yet and this blog seems to be taking on a bit of a life of its own. I've gotten more that I expected to out of the blog but I don't want to set any bloggy goals on content, followers (thank you to the current 19 formal followers), comments (although always welcome), and frequency. This way the drivel that comes from my mind to my fingers to the screen can flow uninterrupted. Is that a blessing or a curse? Only time will tell. My wife has had a hard drive camcorder for a few years now. She was one of the early adopters of this technology and for the most part I believe that she has been happy with her camera. The downside of this technology is that when the hard drive fills up she has to make space by transferring some movies to either DVDs or to one of our household computers. Just before Christmas she realized that the hard drive was filling up and in order to film all the expected Christmas festivities, a review of what was on the camera's drive with a corresponding clean up effort was due. This has not been a common occurrence as there were a few years worth of movies on the camcorder. My wife had to watch them all to see which movies should be kept and archived vs. which could just be deleted (you know those - the kind where the inept husband gets control of the camcorder and takes a movie of his foot for 25 minutes). After she viewed many of the older scenes she commented, "I was looking at the old movies and.....you were really fat, I don't mean that in a mean way but you were really fat." It sounded harsh, much harsher than she meant it to be, but I didn't need to look at the movies. I know I was fat. In fact, I know that I am still fat. Less fat perhaps, but still in the fat category. My body used to be mushy. Now I have muscles and my muscles aren't as mushy (let me pipe in here-there are many, many parts of me that are still mushy but there are other parts that do have muscles). There are parts of me now where they can feel bones under my skin. This never happened to them before. I used to be warm to the touch all the time. Now there are times when I'm cold. They said that these observations are most noticeable while giving me a hug or cuddling. They said, amid laughs, not to worry that they weren't going to stop giving me hugs since I'm not as mushy. I'll run the risk of getting less mushy, but I won't give up on hugs and cuddles. Those who have been following my blog or know me from some other way already know that I am very goal oriented. I'm very demanding of myself and believe strongly that if I set attainable, yet aggressive, goals it helps motivate me to be my best. Goals also must be measurable (simply getting "better" isn't measurable and is more akin to a resolution) and relevant. The first goal I set was to be at least 10% lighter for 2010 Eagleman 70.3 in June than I was for 2009 Eagleman 70.3. This means weighing no more than 226 pounds on race day and translates into losing about a pound per week. It won't be easy but I think this is attainable. Is 10% a good improvement in Functional Threshold power (FTP)? I think I'd be happy with that so put another goal in the books of FTP > 305 watts. Most of these distances aren't what I would call "A" race distances. It is probable that I won't run all of these distances this year. Others might be raced only once. Still others will be somewhat frequent. Some of these distances/races may just be training days where I want a free shirt and water along the way or just want to run with someone. I also know that a 10 percent improvement year on year is unsustainable. Fortunately (or unfortunately) my performance to date and my physical state, I think, gives me a shot at these so 10 percent in 2010 is it. But these times, while nice, got me thinking and questioning which goals are most important. I know that keeping injury free, increasing strength, increasing flexibility and having fun can all be goals unto themselves but are they are very difficult to measure objectively. I also figured that missing some (or possibly many ) of these race time goals isn't going to make or break my season. So what will make this season a success? Then it came to me. The most important goal for 2010 is for both me and my family to believe that I have a reasonable shot at training for and finishing a full ironman distance race in 2011 (full disclosure: I'll be a half century old in 2011). That means that I've improved my fitness. I probably would have reduced my injuries and I'll be having fun. So, if we all believe 140.6 as doable and probable, I will sign up for a late 2011 race in 2010. Which one doesn't matter (yet) but a the biggest goal of 2010 will be my evident my by 2011 race calendar.